I love to get the brown non-descript boxes in the mail, especially when those boxes contain more SoC/SBC investigative opportunities. My gray-scale picture may not do it justice, but the XU4 that I’ve just now added to my lineup is the most powerful SoC/SBC yet. I’d heard much ado about the noisy fan prior to the purchase, but now that I have my hands on the unit, I’m unsure why there is any conversation about noise. It’s really pretty quiet, in my opinion. Maybe I got one of the “quiet ones” – but I don’t think so. The fan does run fairly frequently, but its noise is not even close to the loudness of my regular AMD64 based desktop. In comparison, it’s silent! When using applications that can benefit from the utilization of four or more cores simultaneously, this board really cooks. What is unfortunate is that most software has not been designed to utilize this many processors. Most of the apps that I run on the desktop with this new board are quick enough to say the performance is acceptable for a desktop, so this device will power the new desktop. I’m weaning myself off of all i386/AMD64 systems. I’ve yet to determine whether or not I’ll build the LCD monitor into the CPU enclosure, or not. Given that the XU4 will generate considerably more heat, I’ll probably choose a configuration with a separate monitor, or layer the LCD in some way (such as was done with the Orange Box). A number of apps are not really helped that much by the eight core setup. Java right now is my pet peeve in that area. The version of OpenJDK that I have, and the associated application I’m using (JOSM) refuses to use more than just two of the big cores. That would similarly be the case if I were running JOSM on my 3.3 GHz AMD desktop. If I could utilize more processors than just two while using JOSM, then the new desktop could be faster than the AMD (which has only two cores). As it is, with only two cores in each machine, the AMD is (naturally) somewhat faster. JOSM is not fast even on the AMD machine! That said, the XU4 is definitely an improvement over the C1 that I have in my arsenal. Also, most of the apps I’ll be using will be homebrew, and I can make those use all of the processors. Let the fun begin! This site and author has no direct affiliation with that project. 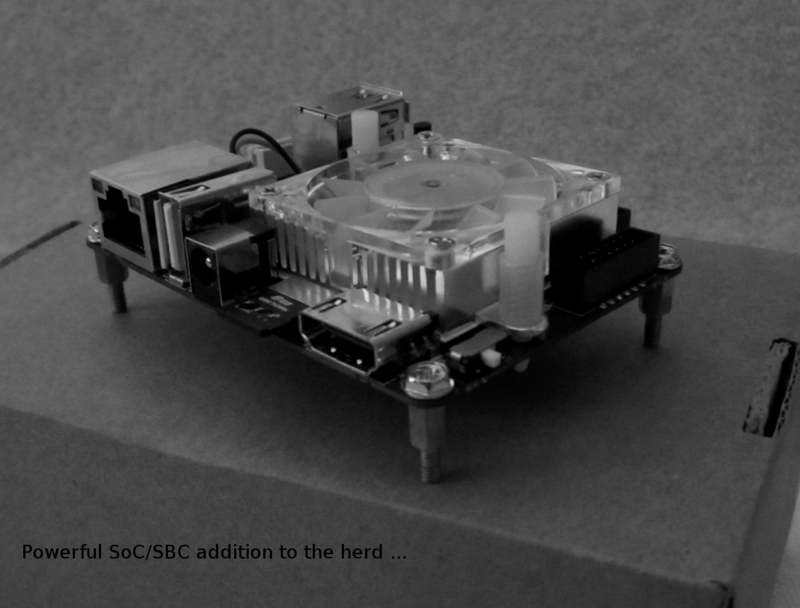 Note: The Odroid xu4 SoC/SBC board discussed here was originally purchased from Ameridroid – the american distributor for HardKernel (http:// http://www.hardkernel.com). ARM is a registered trademark of ARM Limited, and has no affiliation with this site or author. All other trademarks usd here are acknowledged as belonging to their respective owners. Any trademark references put in this text do not imply any affiliation with the owner of the trademark.